The Wash. 1620 Mercator (detail from "EBORACUM, LINCOLNIA, DERBIA, STAFFORDIA, NOTINGHAMIA, LECESTRIA, RUTLANDIA, ET NORFOLCIA"
Norfolk. 1769 J. Rocque in England Displayed (originally published in The Small British Atlas-1753). Norfolk. 1787 John Cary in The New and Correct Atlas. Norfolk. 1787 John Seller in Francis Grose's Antiquities of England and Wales. Norfolk. 1793 John Cary in The Gentlemans Magazine Robert Ross & Co.
Beauties of England and Wales by E. W. Brayley and J. Britton. Great Yarmouth. ca. 1835 Robert Creighton, engr. J.& C. Walker for Lewis' Topographical Dictionary. Norwich. ca. 1835 Robert Creighton, engr. J.& C. Walker for Lewis' Topographical Dictionary. Kings Lynn. ca. 1835 Robert Creighton, engr. J.& C. Walker forLewis' Topographical Dictionary. Thetford. 1835 Robert Creighton, engr. J. & C. Walker for Lewis' Topographical Dictionary. Norfolk. 1836 W. Schmollinger. for Thomas Moule's The English Counties Delineated; or, A Topographical Description of England. Norfolk. 1847 Robert Creighton, engr. J.& C. Walker for Lewis' Topographical Dictionary. Norfolk. 1852 or 1854. 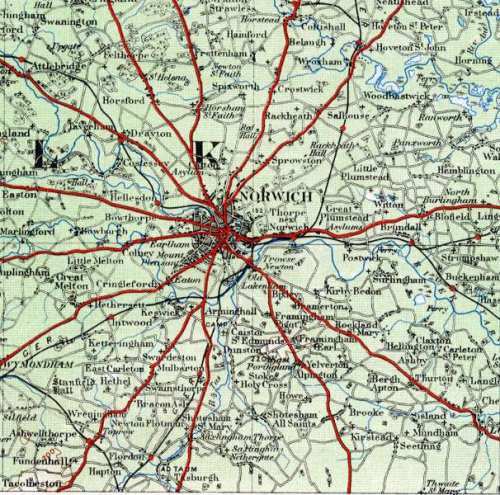 Sydney Hall in A Travelling County Atlas. Norfolk. 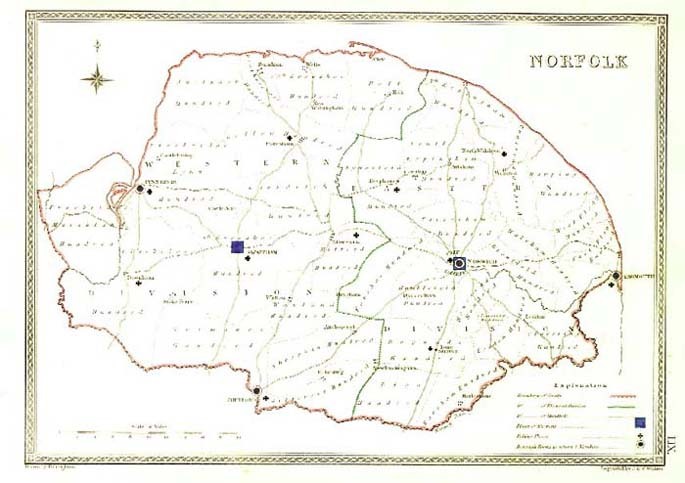 ca.1854 Joshua Archer in Dugdale's England and Wales Delineated. Great Yarmouth area. 1863 Edward Weller (detail from The Eastern Counties Railways published in the Weekly Dispatch . Norfolk. (East) 1885 Report of the Boundary Commissioners for England and Wales. 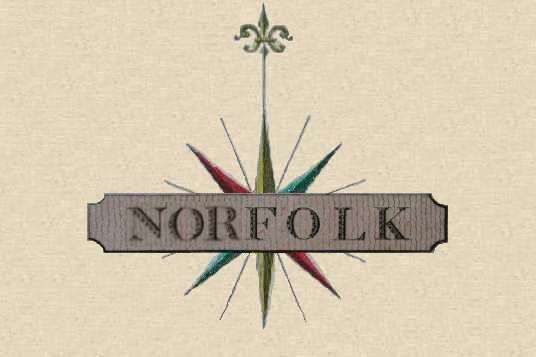 Norfolk. (West) 1885 Report of the Boundary Commissioners for England and Wales.